Not all browsers are equipped with useful features, that the user appreciates. Yes, and this, those who have, They do not always offer good quality. In this article, let's talk about, how to express panel in the most popular Internet browsers. When you open a blank tab large window is displayed in front of us, which are standard shortcuts from Google. Good of them zero, and they take a lot of useful space. 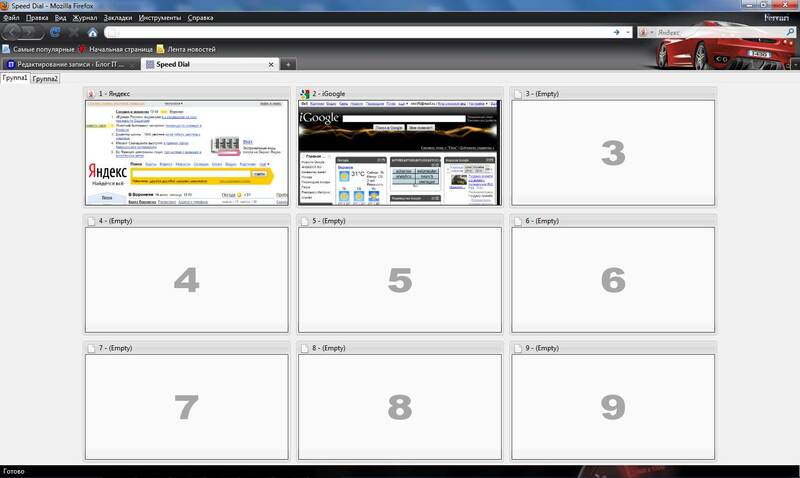 Much more useful would be a special plugin called Speed ​​Dial, allows you to set a blank tab on several tabs. It turns out that something like the New Tab page. To install this extension, you just go to the company store from Google and enter the product name Speed Dial. Next, click on the link will appear, and the browser itself will install and run the application. The setting will be clear even to the beginner, so we will not dwell on this material. Also a good plug-in offers Yandex, but you have to choose. Standard browser does not have a feature – Express bar. This problem is solved absolutely identical to the previous. Even the program uses exactly the same Speed Dial. To install it, you just open the tab “Tools”, then go to the tab “Settings”, here to find the item “manage add-ons” and click the “Search extensions”. In search write the name of the extension and press the “Search”button. After that, the procedure ends, click “Add”. So you start the installation. It remains only to restart the browser and configure expansion. We go through the same, as before, just stop at the “manage add-ons”, We choose our product. Here you are offered the general settings, they can be dealt with by yourself without much effort. Open the main program window and go to “Service”, then click “Internet options”. Before you open a new window, where you should click on “General”, then activate the field “Home page”. Enter the following inscription: “about:tabs” and click “OK”. Restart the program and enjoy the installed panel. Opera is one of the few browsers, which already has a built-in Quick Access Toolbar. That it runs with the browser, do the following:. Press Ctrl+ F12, select “At startup” and click on the drop down menu, here, select the “Open Express”panel. All settings are intuitive. This browser extension is distributed under another name – “Top Sites”. Link to download it can be found on the home page directly underneath the address bar. opening page, application, click “edit”. Here, make the necessary changes. Now you know, how to express panel in the most popular browsers.